Travala.com news, Nano Meetup updates, Nano Donate, developers sit down with RockmSockmJesus and Nanex.com closing. As March comes to a close, we arrive in April with new updates and opportunities for Nano’s growth. While diligent work continues on v19 ‘Solidus’, new developments happen daily involving all things Nano. Let’s take a look at the last week in Nano. Travala adds native Nano payments! Popular travel site and blockchain supporter Travala.com has added Nano as one of their native cryptocurrency payment options! If you’re looking to take a trip anywhere in the world and want to pay in Nano — give them a look! We’re always excited to see Nano’s availability as a payment option expand to new frontiers! Recent Nano meetup in San Francisco, California a resounding success! On Saturday, a group of fifteen Californians came together to chat, drink, and celebrate their shared interest in Nano. We are told it was a lot of fun and we look forward to seeing more meetups around the globe in the coming months. A big thanks to u/CryptoGod12 for coordinating the event! Nano Venezuela meetup rescheduled to April 6th, 2019. Due to recent events in Venezuela, the Nano Venezuela Foundation has been forced to reschedule their highly anticipated meetup to April 6th, 2019. They are hoping their country’s situation will normalize enough that they can hold the meetup that the Nano community so generously funded. Please see their announcement here. Many Nano community-developed tools and services rely on generous donations to help offset costs and accept tips. 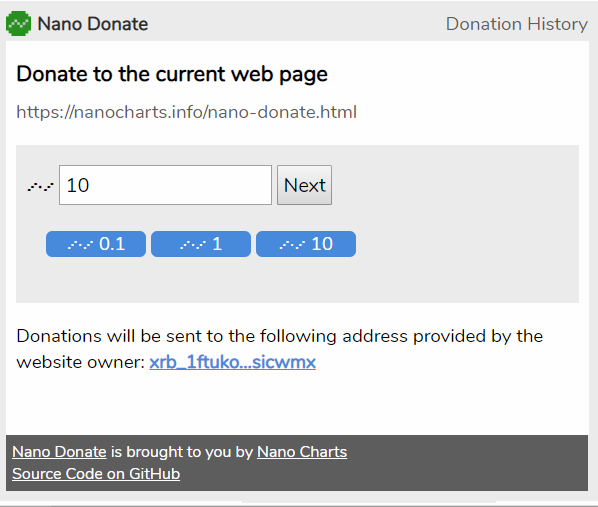 The developer behind NanoCharts.info has created Nano Donate, a useful Chrome extension that makes donating to these beloved services even more natural. Website owners can add a short line of code to their website which will enable users of the extension to donate in a matter of seconds, via their web-based wallets or by scanning a QR with their mobile wallet. Nanex.co announces planned closure on April 30th, 2019. The team over at Nanex.co has announced that they will be closing their exchange on April 30th, 2019. We wish the Nanex the best for whatever the future holds and thank them for their contribution to the Nano ecosystem over the past year. Users have been advised to withdraw any funds from their Nanex accounts before closure. Please consult the official announcement from Nanex for more details. 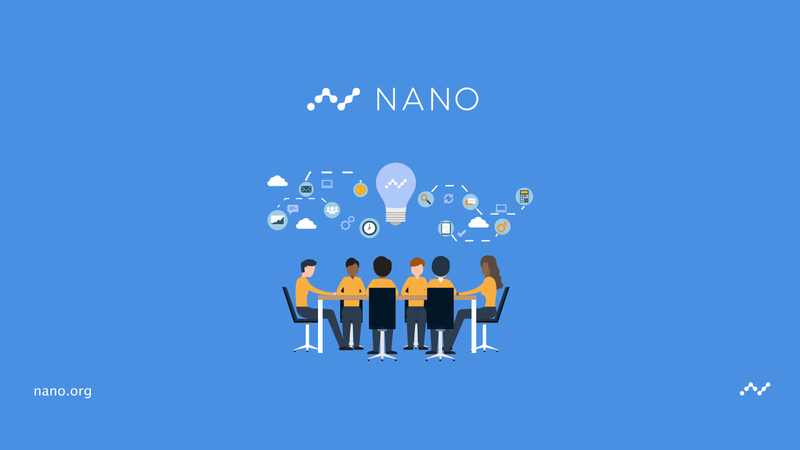 For people who have chosen to delegate their Nano voting weight to the Nanex representative, please consider changing your representative — this thread provides more details on how to do so easily. This week, recently knighted United States Community Manager ‘RockmSockmJesus’ wrote an informative and fun article on the inspirations and creative catalysts of third-party Nano developers within the community. We enjoyed reading through it and hope you did too. For those who may have missed it — here it is! Thank you to Nano Community Manager Brian White for his contributions to this weeks update. Nano Foundation does not endorse or approve products and/or services used or developed by third parties. Any links to third party software or sites are for informational purposes only. Nano Foundation bears no responsibility for the operability, accuracy, legality or content of third party products and/or services. Any questions regarding third-party material should be directed to that party.